Time: Features in the folklore of the native Mongolians, sightings variously collected from Mongolian villagers whilst on expeditions to the Gobi Desert. Expeditions searching for it were mounted several times from 1990 onwards. Some cryptids are destined to become favourites of the public. Bigfoot and the yeti prove ever popular in pop-culture and the media, as does the questionable Loch Ness monster. A newcomer to the ranks of cryptozoological superstars is the decidedly creepy Mongolian Death Worm. First mentioned to Roy Chapman Andrews by the premier of Mongolia in 1922, it only became popular in the 90’s and onward, as expeditions was mounted in search of it. The likeness of this worm to various science-fiction creatures has made it very popular indeed; it even spawned its own movie spin-off. The Allghoi khorkhoi, as native Mongolians call it, is a large, supposedly deadly worm-like animal, able to spit deadly acid, and also kill with violent electric shocks. About as long and fat as a man’s arm, it is likened in appearance to a cow’s intestine, devoid of facial features, and is usually only seen during the hottest months, particularly after rain. Many sightings have been collected from locals in the Gobi, but no foreigner has ever seen it, despite numerous expeditions in search of it. It seems likely that the hyperbole of these creatures deadly attributes are mere fantasy, as may be the creature itself. Karl Shuker and others suggested that it was most likely a snake or legless lizard, and not a true worm, which would surely dry to a crisp in the arid climate. Despite the unlikely nature of this creature, it may be an exaggerated myth associated with already known desert reptiles, like the sand boa. How shall we unite all the odd features in a speculative account? The Allghoi Khorkhoi (Ophidovermis intestinoides) of the Gobi desert is not a worm at all, but a large legless lizard, related to the slow worm and glass lizard. Up to 1.6 meters long, and as thick as a man’s arm, it preys mainly on small creatures found in or just above the sand. Very often it will ambush scorpions, spiders, mice or lizards by catching them from below, or catch small snakes that are also buried in the sand. The deadly nature of this creature is much exaggerated in the folklore of the natives; indeed, it does spit liquid when threatened which does cause an acidic burning sensation, but this chemical spray is meant to irritate the aggressor, not to kill. As to its supposed electric attacks, these seem to be based on its supposed appearance after rain, lightning being a more likely culprit. 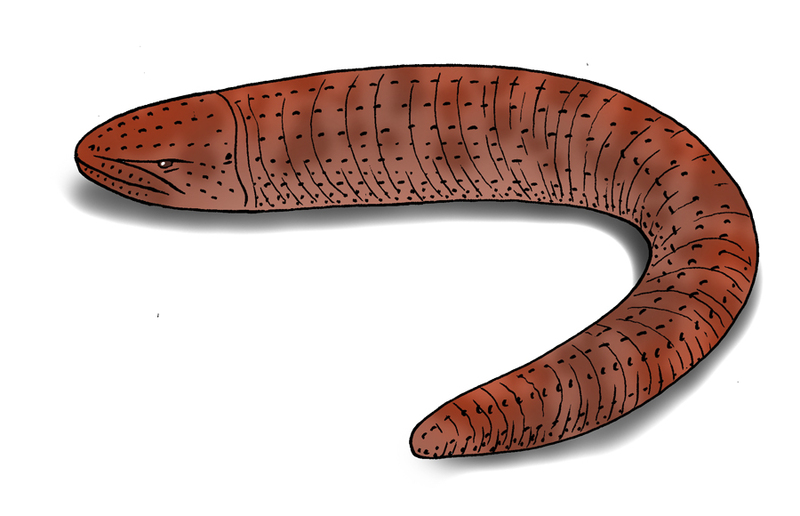 The skin is dark pink and blotchy, covered in small, granular scales, and concentric wrinkles, which coupled with having no apparent neck, has led to it being likened to a worm. It does have a distinct head, eyes and mouth, but these follow the contour of the body, and can be easily overlooked. All in all, this much-maligned creature is fairly harmless, the worst that can befall you, is a splattering of irritant spray to the face or arms, which can be soothed by moisturizers and even aloes.